Many of our users work with agile methodologies that do planning at the Epic, Story, and Task levels. You can use the "Plan Level" to help you add parent and child tickets at multiple levels - Epic, Story, and Subtask. You can add Subtasks to a story on the sidebar, or Related Tickets tab. Subtasks are the steps required to complete a Story. They help you organize design, development, and bug fixes before the Story release. Epic is the top level. An Epic describes a big feature that you will implement over time, by releasing a series of stories. When you move a Story to a new milestone, you move all of its tasks with it. Tasks are tightly attached to a Story. We assume that tasks are always finished at the same time as the parent Story. You cannot move a task to an implementation milestone, like "Current", without moving the parent Story. You release a Story, not the tasks. If you have an Epic in your backlog, you can move its Stories to the Current or implementation milestone one at a time and release them one at a time. Stories are loosely attached to an Epic. So, you can finish Epics incrementally. You can implement "Feature 1" and then later implement "Improved Feature 1". You can set the Plan Level to Epic, Story, or None in the sidebar field. When you create child tickets of an Epic, you will create Stories (loosely attached). When you create child tickets of a Story, you will create Tasks (tightly attached). It sounds complicated, but it will work by default. You can only create Tasks by adding them to a Story. Stories make your planning views smaller and easier to manage. They describe the important features that you want to release, and they hide extra details in subtasks. It is a good practice to plan your backlog with Stories. Then, when you move a Story to the current sprint or milestone, you can expand it with more detailed tasks. Traditionally, a Story describes a complete function for a particular role, in the form "As ... I want to ... so that ." For example, a Story could say "As a Scrum iteration planner, I want to open a story in the planner, and add tasks to it, so that I can more clearly define and estimate the work in the current sprint." You can use the subtasks in a Scrum planning process, or you can use them as an informal to-do list. 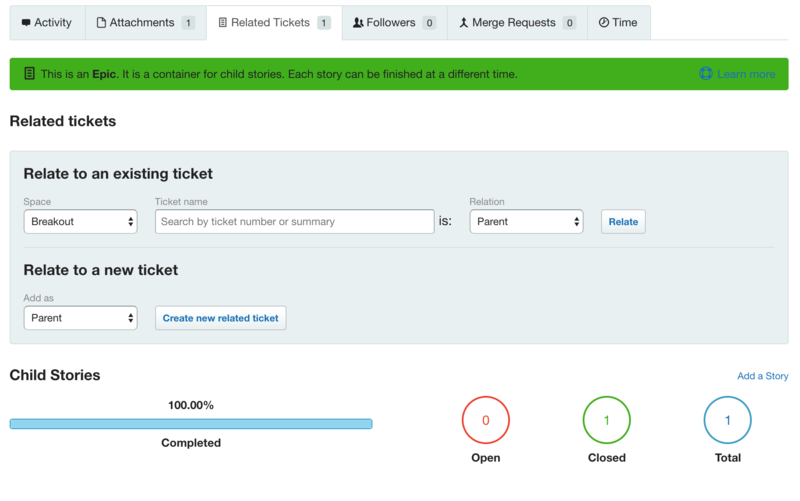 To add a subtask, open the parent Story ticket and view the Related Tickets tab. There, you can either relate an existing ticket as a subtask or Create a new related ticket to add a subtask to the Story. Tasks move with the parent Story ticket. So if you sort the Story or move it to the Current column or to a different milestone, the tasks go with it. Use this relationship to make a list of tasks that should be completed before you release the parent Story. You can also see the Tasks on the “Related Tickets” tab of the parent Story ticket, and you can add or edit tasks right inside the Story ticket. The tasks are complete tickets, so you can assign them, discuss them, and see them in Cardwall and List views. 1) You can use Stories and Tasks in a classic Scrum planning process where you write Story tickets and put them in your backlog, without tasks. The Story ticket describes the function, not the implementation. It includes a summary of the user goal and functional requirements, for example “I am a user and I want X, so I use the system do this action…” Then, after you pull a ticket over to the Current work column, you expand it by adding more detailed implementation tasks. Then you finish all of the tasks, and close the parent Story. 2) You can use this to make your backlog smaller and easier to handle by grouping several backlog tasks together under one functional story. You can drag and drop tickets into the story tray under a parent ticket. Epics are a feature to help you organize bigger backlogs. You can sort a list of 20 or 30 Stories into a sorted backlog. After that, you will want to organize them by topic, or "Epic." The child ticket in an Epic is a Story. Stories are not strongly attached to their parent Epics. You can take Stories from an Epic one at a time and move them into different implementation milestones. You can work with bigger backlogs. You will organize the Stories in each Epic as a separate topic, without looking at the complete backlog. You can distribute planning work to more people, by assigning different Epics to different people. Epics help you to be more agile, because you can finish stories one at a time, and implement the Epic incrementally. You want to release frequently and incrementally. And, Epics help you see what is completed. You can see what Stories are done, what Stories are in progress, and what are in the backlog. The Outline clearly shows your Epics in the left column. And, you can select the Epic type as part of a list filter. 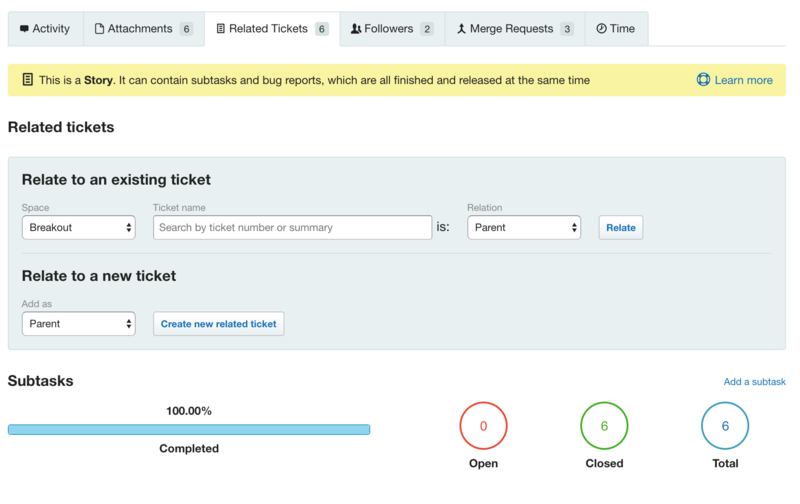 On a Story, the Related Tickets tab helps you add Subtasks. On an Epic, the Related Tickets tab helps you add and manage and schedule Stories.